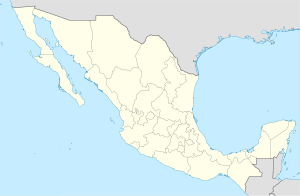 Santiago (Spanish [santia'go] (help·info);previously Aiñiní) is a small town in Los Cabos Municipality in Baja California Sur, Mexico, located on Mexico's Highway 1, about an hour's drive north of San José del Cabo. Like Todos Santos it is almost directly on top of the Tropic of Cancer. It is also home of the only zoo in Baja California Sur. The Misión Santiago de Los Coras in Aiñiní was founded in 1724 by the Jesuit missionary, Ignacio Maria Napoli, and closed in 1795; the subsequent Church of Santiago Apostol was built nearby. ^ Crosby, Harry (1994). Antigua California: Mission and Colony on the Peninsular Frontier, 1697-1768. UNM Press. pp. 107–. ISBN 978-0-8263-1495-6. ^ A Gift of Angels: The Art of Mission San Xavier Del Bac. University of Arizona Press. 2010. pp. 145–. ISBN 978-0-8165-2840-0. ^ Palmerlee, Danny (2007). Baja California and Los Cabos. Lonely Planet. pp. 202–. ISBN 978-1-74104-564-2. This article about a location in the Mexican state of Baja California Sur is a stub. You can help Wikipedia by expanding it. This page was last edited on 13 July 2018, at 14:06 (UTC).